Good question. Because in order to beat them, we need to know our enemy! 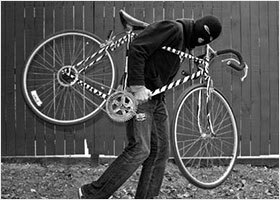 So in this post first we’ll look at the two different types of bike thief. And then we’ll examine the eight most popular tools they’re using to steal our bikes. I’ve also added some videos of real thieves stealing bikes with these tools. There are broadly two different types of bike thief. The first and most common, is the opportunist thief, who is certainly carrying cable cutters, maybe some medium sized bolt cutters, maybe a crowbar. The opportunists are looking for any bikes secured with cables, weak U-locks and puny chains and padlocks. No bike is too cheap or tatty to escape their attention. But the good news is: a decent U-lock or chain lock will usually be too much for their limited tool set and they will pass over your bike for easier pickings. The second type is the “professional” bike thief who will certainly use very powerful bolt cutters and may have access to a variety of power tools such as portable angle grinders and bottle jacks. 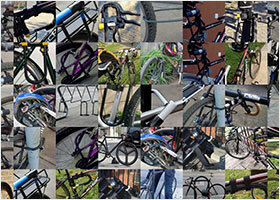 The professionals target the more expensive bikes and may even steal to order. They can defeat any lock given enough time. So if you have a bike that a “professional” may covet, you’ll need the best quality lock and you’ll need to be very careful about where you leave your bike and how long you leave it for. Yep, believe it or not, many cheap bike locks can be broken with your bare hands. And you don’t have to be built like the Incredible Hulk! We’re generally talking about cable locks and locks with combination mechanisms here. A pair of hand held cable cutters will cut through most cable locks in a few seconds. Cheap, inconspicuous and easy to carry around in a coat pocket, this is the tool most commonly used by bike thieves. And it’s worth repeating again: they will cut through nearly all cable locks in seconds. Just like a pair of cable cutters, a hacksaw is cheap and pretty easy to carry around unnoticed. And just like the cable cutters it will slice through a cable lock very easily. With enough time, a hacksaw will also cut through low quality U-locks and chains which tend to be made from thin, soft metal. Cheap, poor quality mechanisms can be smashed to bits with a hammer. For the thief, it’s much easier if they can hit the mechanism against a hard concrete ground. So using a good locking technique that keeps your lock as far from the ground as possible is important. Crowbars, scaffold poles and other long pieces of metal are often used in leverage attacks on U-locks. The longer the better, they’re obviously a bit more conspicuous! But they’re very effective, even on mid range U-locks. A smaller U-lock and good locking technique can make this much more difficult for the thief. Bolt cutters come in a variety of sizes (usually 8″, 12″, 18″, 24″, 36″ and 42″). The smaller bolt cutters (8 and 12″) are easily concealed in a backpack and will make mince meat out of all cable locks. What do you think this man’s got down his trousers? Medium sized bolt cutters (18 and 24″) are often carried beneath a long coat, hanging from a piece of rope around the thief’s neck. They’ll defeat weaker chains and U-locks. The biggest bolt cutters (36 and 42″) are usually only used by serious bike thieves. But they can crop mid range U-locks and chains and sometimes even the higher end locks. 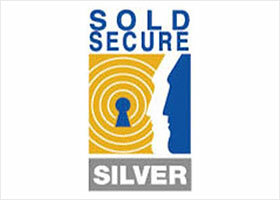 To guarantee that a lock cannot be cropped by any manual bolt croppers you need a lock made from good quality, properly hardened steel with a diameter of 16 mm. But bear in mind not everyone with 36 or 42″ bolt cutters can crop a high security locks that’s less than 16 mm thick. It takes a thief with considerable skill (and weight!) who is able to maneuver the lock into a favorable position where they can use the ground for leverage. Again, good locking technique can minimize this risk. 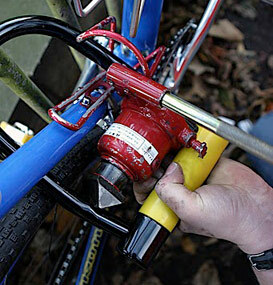 Hydraulic bottle jacks are used by some of the more serious bike thieves. Inserted into the space inside a U-lock they can exert enough force to pop open even the most secure locks. This is why smaller U-locks are generally safer: there is less space available to fit a bottle jack. It’s also why a good locking technique should always try to fill up as much of the space inside your U-lock! Portable, battery powered angle grinders are only for the most audacious thief. They make a lot of noise and produce a lot of sparks. So they should attract a lot of attention. However, time and time again we see passersby ignoring thieves stealing bikes. So maybe they don’t really need to be that audacious! Angle grinders will cut through any lock given enough time. However, the thicker the lock, the longer it takes. And the greater the risk the thief will be disturbed. With the very thickest locks like the New York Fahgettaboudit, they may even need to carry a spare battery to get through it. But at the end of the day, there’s not a great deal you can do to guard against angle grinders, save for leaving your bike in the most public places you can find for the shortest possible time. So there you have the most popular tools for stealing bikes. As used by both opportunist and “professional” bike thieves. There are of course other ways to defeat bike locks. They can be picked. They can be frozen with aerosols and then smashed with a hammer. They can be blow torched. But these methods aren’t widely used by bike thieves. Probably because they are either more difficult, less effective or more costly. And what can we learn form this? Well, the most important lesson is this: never, ever use a cable lock. 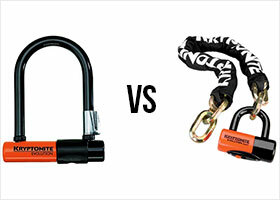 If you use a decent U-lock, it won’t be beaten by wire or cable cutters. No-ones going to rip it off with their bare hands. It will take an impossibly long time to cut through with a hacksaw. It can’t be smashed open by a hammer. And small or even medium size bolt cutters will not be able to crop it. And with a good locking technique that keeps your lock as far from the ground as possible and leaves little space to insert bottle jacks or lengths of metal that are used for leverage attacks, you can vastly reduce your exposure to these other methods. An angle grinder will always be able to defeat your lock. But there’s not much you can do about that. If your bike is desirable enough to attract a thief with an angle grinder, you should take steps to ensure your bike is never left anywhere such a thief might have access to. If you’re thinking your current bike lock might not be up to the job, please check out my bike lock guide where I will show you the three simple steps to find the best lock for you and your bike. Great site, thanks. What do you think about a cable lock with a 10 db alarm padlock on it? I don’t like cable locks at all. Even with alarmed padlocks! They won’t stop a thief snipping through the cable and making off with your bike. Get a decent u-lock, chain or folding lock instead. Great site with a lot of useful material thanks! Have you ever heard of the ‘cafe stop lock’? This is a concept among road cyclists in the UK (I don’t know about other countries) and it’s a very lightweight lock used to secure a bike which is in sight of the owner. For example, a bike leaning against the windows of a cafe where the cyclist is inside enjoying a nice cream tea. Many road cyclists simply will not consider going on a ride with a 1.5kg lock or a 1kg or even a 750g lock. So they buy a 150g cable lock on the grounds that it protects in two ways. Firstly, it stops someone without tools e.g. a bored teenager seeing an unlocked bike, jumping on it and riding away. Secondly, it means that theft will involve breaking the lock, which even with the best tools and the most experienced criminal will not be instant. The thief has to retrieve their tool, position it, cut the lock, remove the lock from the spokes, mount the bike and ride off – and do all this in less time than it takes for the enraged owner and friends to get from their table in the cafe to the bike outside. This is often combined with other ‘slow them down’ techniques, such as putting helmet straps through the spokes and leaving the bike in a very low gear…. Obviously, this approach only works if multiple conditions are met. Firstly, someone has to keep an eye on the bikes at all times. Secondly, the environment has to be low-crime, such as a sleepy village. Thirdly, it has to be possible to get to the bike in a few seconds. But for a lot of recreational cyclists, that’s actually quite a common situation. Yes I have heard about these “cafe stop locks”. I was thinking of doing an article about the best locks for road cyclists, which would cover such things. I didn’t know about the other “slow them down techniques” though … thanks for the heads up! Other slow-down techniques I’ve heard of are loosening the wheel skewers and joining the frame and wheel with heavy-duty cable ties. In fact, some roadies take a couple of cable ties with them instead of a cable lock, on the grounds that they last about the same time against a determined thief as a cheap cable lock. Haha, brilliant. I completely agree that a cheap cable lock is about as much use as a cable tie! er…what? ALL road cyclists in cities (Barring those that for the sheer convenience store their locks on racks) carry u locks and chains that weigh between 1-2kg, it’s standard so I have no clue where you got that information from I think you’re confusing them with racing cyclists? And let’s face it unless you have legs like a baby sparrow why should anyone have an issue with carrying an extra 2 kilo let alone 750g. Yes I think in this case Peter, I think “road cyclists” = “racing cyclists”. Oh I see what he means. Well yeah in those situations fair enough. I’d probably buy one of those very light chains instead that weigh about 150-300g. They’re only cheap but they look much better than a cable, cables just look feeble even from a distance. I’m going to be looking at some of the newer cable lock alternatives shortly. There’s quite a few locks coming out that are super light. And while not super secure, if they’re able to resist wire cutters better than cable locks, I think they’d be a good choice for racing cyclists at cafe stops etc. Maybe include a look at the tigr lock if coming from that perspective. It’s expensive as hell but also light as hell. I’ve already reviewed the TiGr mini. I’m a big fan! 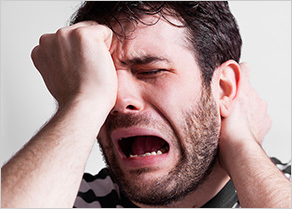 Hi, great post ! And so useful. Would you mind if i translate it in french on my (non-profit) blog ? First of all, thanks a lot for your website, it’s been very helpful (Abus 540 Granit X-plus is on its way). There’s just one thing I wonder about and can’t find any info: How easy is it to cut a chain with an angle grinder when the link is not clamped in a vise (as in all the videos I’ve seen), but wobbling around between bike and railing? Yes it’s definitely harder to cut through a chain when it’s not clamped in a vice. So it will take longer. But it’s still possible as the thief will usually be able to find a way to maneuver the chain so that it’s anchored somehow. And unfortunately thieves are already cutting through bike racks rather than bike locks! What they tend to do is pre-cut the rack and then cover the cut with tape. Unsuspecting cyclists will then lock their bike to the rack without realizing it’s already been compromised. The thieves then return, un-tape the cut and make off with the bike! I’ve just learnt that even in a small French town you can drive up, install a generator and use an angle grinder to cut through a lock – and all onlookers will do is offer helpful advice (“you don’t need a generator, there’s a power outlet right there…”). So happened to a friend whose son had lost the key while the bike was locked to a rack. Still, I don’t think things are as bad as in London… By the way, what does British legislation say about ownership of previously stolen goods? I read the account of some ex-crackhead who told he’d just take his stolen bike to the nearest place where there were plenty of people where he’d sell it without problem for 20 pounds or so – with people knowing exactly what he was and that the bike was stolen. Now both in Germany and France you’d risk losing your money and the bike and having trouble with the law because there is no way you can become the legal owner of a stolen item. At the very least, if it’s ever discovered that the item was stolen, it will be seized and returned to its previous owner – at the worst the buyer could go to trial for dealing in stolen goods, I suppose. Yeah this is a big problem that we need to tackle. Everyone knows when they’re buying a stolen bike. But if you do, you’re complicit in the theft. I think we need to educate people more on the consequences of what they’re doing. And yes, maybe there should be stricter punishments for people buying stolen bikes. There is a u-lock out there that if you try to break it, it nuk bombs you with a smell that leaves you smelling like you got nailed by a skunk, can’t remeber what it was called, I read about it in Cycling Magazine awhile back. Yeah that’s the Skunk Lock. I’m looking forward to trying it out when it’s released! After having 5 bikes stolen in various situations over the last few years – everything from a junker commuter bike to a performance road bike and in between – I am reluctant to leave my bike out of sight. What kills me is that people witness this in broad daylight and don’t even do anything about it (as witnessed in the videos). I have the Abus and figure it is the hardest to break. I don’t mind the extra weight during the ride. No more cable locks are allowed in this house – even if they come in cute jelly colors! Also – shout out for the Portland Police for reclaiming one of our bikes following STP. It took a year, but it was nice to have it back. I just discovered this webpage and it’s going to be my reference site for keeping my bike safe! I just got stolen my very nice (and expensive…bike thieves know what’s good) bike from the basement of my apartment building..! This is the second bike I’m stolen in 5 years in the capital city I live. Good point Grace! I think we can all get more involved with stopping bike crime. Are there any published statistics on the most commonly stolen frame sizes? Seeing as I ride a 23″ frame because I’m 6′ 2″, surely that is a deterrent in and of itself? What’s the use of stealing a bike you’re too short to ride? Almost all of them will be sold on rather than kept by the thief. I doubt they pay any attention to frame size unless they’re stealing to order. Thousands of recreational riders routinely cover 20-100 miles in a day, and none are going to lug more than a token light lock/cable on long rides. 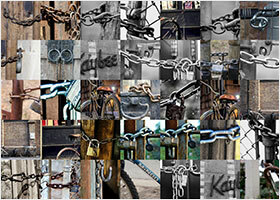 With a group, each can trade off guarding the bikes; five riders with three or four locks can bundle in mass, weaving all bikes together and nesting the cable/locks tight, and inside the bunch to complicate access with cutting tools, and require a thief to defeat all before even one bike can be freed. Solitary rural stores are very low-risk for short periods; dense urban areas with traffic and many low-budget businesses sadly attract more types likely to include thieves. Public racks at apartments, malls and campuses are high risk spots. If possible, figure a way to put valuable bikes indoors, in your office or residence. Once left, every unlocked seat or wheel is at risk too, to replace ones on other bikes the thief already has. If registration/licensing is available, do it – or make your own equivalent by taking a close-up shot of each bike’s serial number, along with several moving out to clearly show continuity with the rest of the bike, its color, equipment, wheels, etc. Smartphone images usually have timestamps, even GPS info, and having pictures verifying the bike was at your residence a year before it was stolen are hard for a thief to contradict. Without serial number or registration, you will probably never get your bike back even if it is recovered. Thanks for your site. I ride an Azub recumbent Trike and would ask the best way to secure it. Based on your recommendations I like the Gold level folding lock. Those trikes are really expensive aren’t they? I don’t think a folding lock (even a Gold level one) will be secure enough. I would go for a heavy chain like the Kryptonite New York Noose or even the New York Fahgettaboudit chain. They’re much heavier than the flolding locks but they’re also more secure. What is the best way to route a chain lock to secure a Trike or to use a D-lock (or both if that’s more advisable). It’s a different animal than a diamond-frame bike, for sure.